Weddings are extra by nature. I mean, when’s the last time you asked someone to formally RSVP to something (besides maybe your high school graduation)? 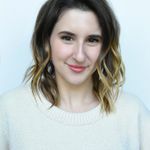 And it’s no different when it comes to their effect on the environment—even if you’re normally a pretty earth-conscious person, getting swept up on wedding planning madness can make you 10x more consumptive than you ever thought you’d be. 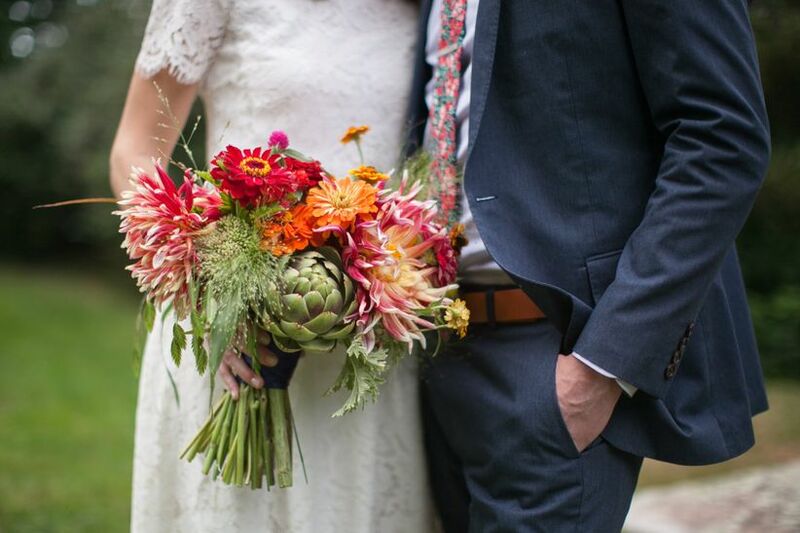 Luckily, now more than ever, there are easy ways to have an eco-friendly wedding—and just as gorgeous—so you don’t have to sacrifice style for eco-consciousness. Here are some of our favorite eco-friendly wedding ideas that can help you save money in the process. 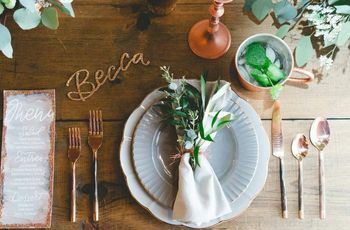 Save-the-dates, invitations, thank-yous, and more are all key factors in establishing the style of your wedding, and make great wedding day keepsakes, but who says the RSVPs need to be paper, too? You can set up a digital RSVPing system on your wedding website, then provide the URL and simple instructions on how to RSVP on your wedding invitation, and skip the reply cards, envelopes and stamps altogether. Not only will you save a ton of paper waste, you’ll also save money on postage, printing and more—oh, not to mention, no hand cramps from hours of addressing the return envelopes! Even better, you’ll have an easier time of tracking who’s coming and who isn’t with RSVPs that are sent directly to your online system (plus, people will be less likely to wait till the last minute to RSVP if they don’t have to take a trip to the mailbox). Florals can be the most natural element of your decor, but ironically, can also be the least environmentally conscious elements of all. Out-of-season florals and exotic picks are all imported from other countries, which means it costs lots of emissions to get them to your wedding (and lots of money for you). Flowers from farms that aren’t organic are also not good eco-friendly wedding ideas. Your best bet for eco-friendly flower ideas? Working with a farmer florist, who will create your wedding arrangements from (likely organic) blooms she grows and maintains herself (likely locally). If you can’t find one or they’re out of budget, ask the florist you do hire to source only in-season blooms, and work with as much local product as possible. Other ways to amp up your florals without amping up your environmental impact are to use lots of greenery (and less flowers), and to decorate with potted plants or succulents (which can double as favors!). Finally, see about donating your centerpieces and other arrangements to a local hospital or similar after your wedding, so your beautiful florals can continue to be enjoyed rather than being tossed away. Many wedding insiders agree—favors are oft the most overlooked elements of a wedding. You may put a ton of time and money into purchasing hundreds of the perfect thing, only to find that barely 30 percent of them were taken at all, and the remaining 70 percent are left behind for you and your new spouse to shove in a closet for all eternity! If you still want to send them home with something, consider an edible favor—like trays of chocolate chip cookies arranged near the exit right after the last song plays—or just going extra on the dessert table after dinner. If that still doesn’t feel like enough, consider a plantable favor—like a seed packet, local tree sapling or potted succulent—perfect for your green wedding. 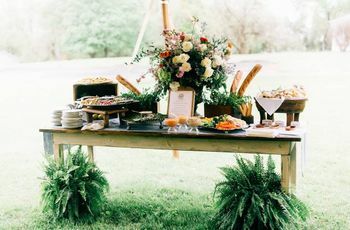 It may seem like a nice thing to do to surround guests with more food than they could ever possibly imagine at your wedding—from pre-ceremony snacks to a dozen cocktail hour stations to a seven course meal to a food truck-filled after party. And, yes, everyone loves food, but no, people do not magically develop three stomachs when they show up at weddings—so why do we all tend to overdo it with the menu, leading to tons and tons of wasted food, money and resources? 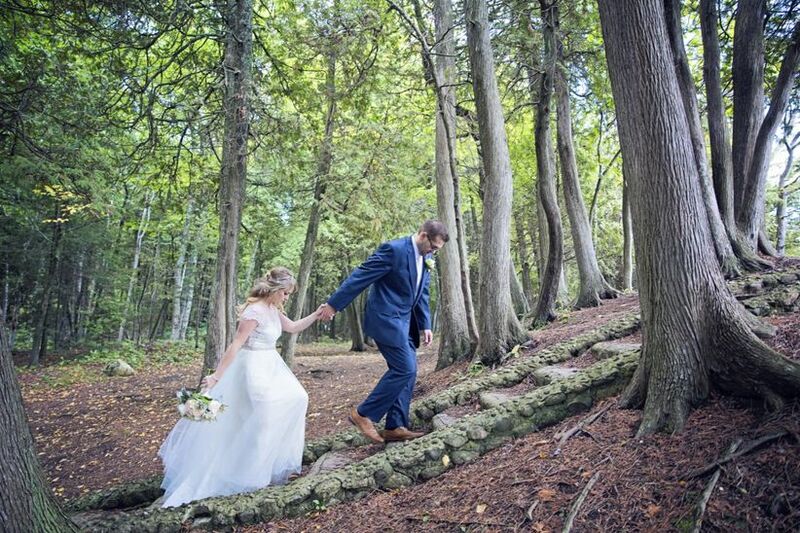 If you want to have an eco-friendly wedding, keep in mind the golden rule of quality over quantity. 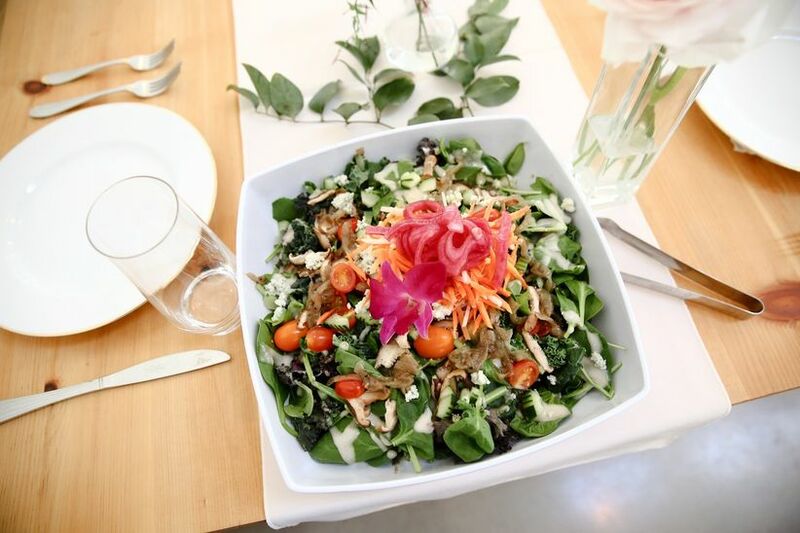 Book a caterer that cooks with local ingredients—extra points if they farm their own ingredients. Keep cocktail hour snacks thoughtful yet light, and stick with classics like meats and cheeses, crudites and simple passed appetizers. Then, when it comes to dinner, you’ll have the budget (and guests will have the appetites) to indulge on a high-quality, local, farm-to-table dinner that guests will totally rave about. To minimize waste, go for plated portions over buffet—and have a plan for what to do with leftovers (Freeze? Donate? Share with catering staff?). It can be so tempting to get caught up in the convenience of buying everything you think you may need for your wedding—because seeing it right there in the store and being able to scoop it up and cross it off your list sounds like a huge load off your shoulders! 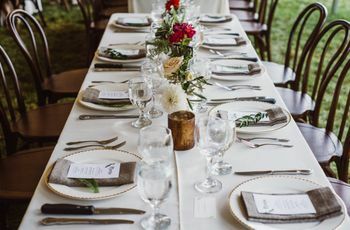 Not to mention, dealing with rental companies sounds like a lot of emailing, site visits and contracts—but, if you’re concerned about your environmental impact (not to mention, your budget) and need more green wedding ideas, rentals are the way to go. Buying decor (especially in multiples) for your wedding means you’ll be stuck with tons of (matching) stuff to deal with afterwards—which you’ll probably end up tossing out or stashing in your garage (to be later tossed out). Renting simply means no waste, no responsibility for the items after your big day concludes, and, likely, a much better, more curated selection to choose from than what’s available at your local craft store! Score extra eco points by renting from vendors who source vintage and estate finds—this means you’ll get awesome, one-of-a-kind pieces for your wedding at no cost to the environment. 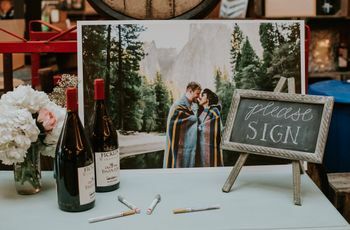 Whether you do one of these or all of these, or simply ask your bartender to make sure that all the empty wine bottles get recycled at the end of the night, utilizing eco-friendly wedding ideas for your wedding doesn’t have to be hard, or game-changing. You can still have the wedding you’ve always dreamed of, while keeping the earth—and your budget—in mind.